Do you have a mischievous pet? 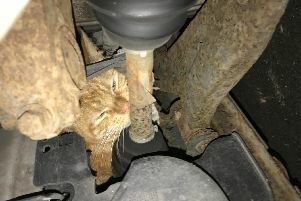 We all love our pets, but sometimes they can find themselves in a spot of bother, such as knocking over heat lamps and walking paint through the house. Pets are a welcome companion for the over 50s but it seems they keep their owners on their toes and can cause chaos in their homes, according to analysis of Saga Home Insurance claims data. One Saga customer was relaxing at home when her husband starting shouting for her help in the hallway. She leapt up and discovered that there was a fire in one of the rooms. After putting out the fire and investigating the damage the customer realised that her two pet tortoises had knocked over the heat lamp which had started the fire. Luckily the tortoises were unharmed but the damage cost more than £6,000 to repair. One policyholder was at home looking after her daughter’s puppy when the next door neighbour’s cat strolled through the garden. The dog leapt up to scare the cat away but didn’t realise the patio doors were shut and charged straight through them causing the glass to shatter everywhere. It cost over £2,000 to repair the damage. When a Saga customer returned home after a long day shopping she noticed that all her favourite antique ceramic ornaments were smashed on the floor. At first the customer was worried that she had been burgled but then she saw her next door neighbour’s cat sitting amongst the chaos. The clumsy cat had knocked the items over and it cost more than £500 to replace them. One policyholder asked his wife to take their dog out for a walk while he did some decorating. When his wife got home she let the dog off the lead forgetting that her husband was doing some painting. The dog ran straight through some wet paint leaving white paw marks all over the house. It was a costly mistake and they had to replace all the carpets. One customer wanted some peace and quiet so took his hearing aids out and placed them on the coffee table. However, as he got up to make himself a cup of tea his dog jumped up and thinking he was pinching a tasty treat swallowed them whole. Having made a dogs dinner of the hearing aids it cost almost £2,000 to replace them. Saga communications director Paul Green, commented: “We are a nation of pet lovers, but even the best behaved dog or cat can leave you with a big bill. Animal accidents in the home can cost thousands to put right.